I’ll have an update on the shop and the GT in the next few days, I hope, but in the meantime, here’s the poster I designed for this year’s All British Field Meet in Bellevue, Washington. I agreed to help my friend Steve by building the web site, online databases, various other software pieces and doing the graphic design for the meet. Steve was clueless generous enough to take up the mantle of organizing the show after Arnie Taub passed away–and is doing a bang-up job. 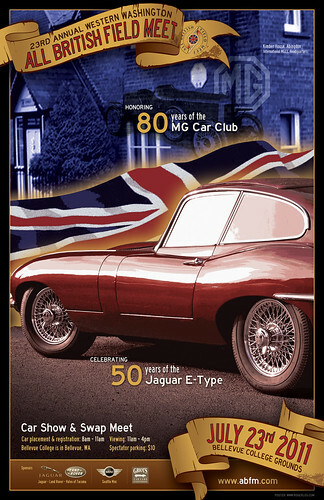 This year the show honors 80 years of the MG Car Club of England, and 50 years of the Jaguar E-Type. By coincidence, I have an E-Type which is 50 years old this November, though at this juncture I’m pretty sure it will not be running by its birthday. I had hopes a few months ago, but my to-do list is so long with things not E-Type that I just don’t think I’ll be able to find enough time to get her back on her feet by then. Uhhh, your linky for abfm.com isn’t right. Way to go, Herr Webmaster. So, this counts as charity work for $500/hour of your time, right? Link doesn’t work? In the world of easily-revised web-page copy, it doesn’t look like you’re right (anymore). Love the poster. How could I get a copy for my garage?